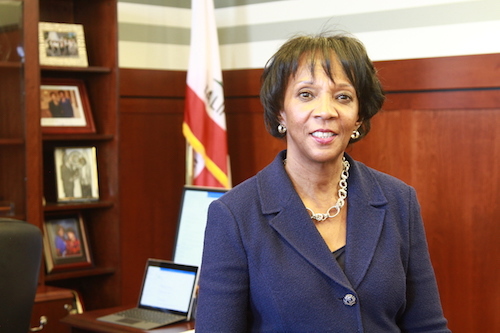 Los Angeles County District Attorney Jackie Lacey is in a powerful and controversial position to say the least. As the first woman and the first African American person to hold the position, Lacey is faced with daily challenges and tough decision making that can be polarizing to the masses she serves. A constitutionally created office, the district attorney is responsible for prosecuting cases involving violations of state law. The L.A. County District Attorney’s office is the largest in the nation, there is no larger office. Lacey leads a team of about 1,000 lawyers and about 300 sworn investigators. Being that L.A. is one of the most populated counties in the nation with an estimated population of 10 million, Lacey’s team of prosecutors has difficult challenges dealing with crime. In the national discussion about prosecutors and police, there is a perception in communities of color that the prosecutor’s office does not work in their favor as much as it does for other communities and there is a discussion about unconscious bias. Lacey wants to be the first DA’s office in the nation to require all of her lawyers to go through training to eliminate that bias. She wants to ensure that the DA’s policies are fair and not slanted against people because of their economic status or their physical characteristics. She also wants to ensure that when her prosecutors are prosecuting a case, that defendants are getting a fair trial and that they are not putting anyone away for the wrong reasons and that they treat victims from all communities with respect. 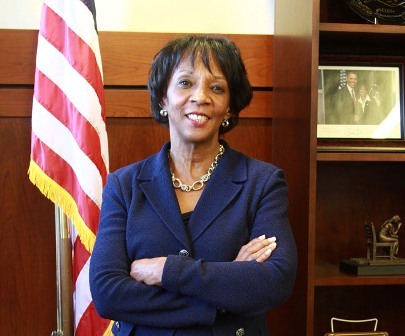 “We are the most diverse prosecutor’s office in the nation,” said Lacey. “People may not realize, although we have 1,000 lawyers, about 53 percent of them are women, nine percent of our prosecutors are African American, 12 percent are Latino and a little bit more of that 14 percent are Asian. So, we pride ourselves in reflecting the community and reflecting jurors and I think that is important when we are discussing in our policymaking room certain issues, we need that diverse opinion. “One big thing that we have done and I am so proud of is create the conviction of review unit. Only about 11 offices that I know of have had the conviction review unit and that’s to provide relief for those who have been wrongfully convicted…It is my position that you should never as a person or prosecutor say I’m done, I sought justice in a case. If there is one person in prison who has been wrongfully convicted and new evidence comes that shakes your confidence in the evidence that was used to convict that person, you have an absolute duty to look at that. Growing up in the Lacey household, Jackie recalls there was a photograph of Martin Luther King, Jr., John F. Kennedy and Robert F. Kennedy. Her dad loved talking about history and she is sad that he didn’t live long enough to see her being sworn-in but knows he was there in spirit. The Sentinel asked Lacey about her legacy and how she hopes to be remembered. She shared that she wants people to know she may be quiet but she is competitive. “I want them to look at the wall of District Attorneys, I’m number 42, Jackie Robinson’s number,” Lacey said. As for up-and-coming attorneys and potential prosecutors who want to follow in her path… “go for it,” she said. “If you are willing to work hard, make sacrifices, I think your dreams of becoming a lawyer, prosecutor, defense attorney is absolutely attainable. I came from a family where we didn’t have very much. Our house was modestly priced. I went to schools on scholarships, grants and loans. I’m just a kid from Dorsey High School, I still feel that way some days and if I can make it and our parents can make it and we can have an African American President, what excuse do we have, what are we waiting for?